OnQ coming to an event near you! OnQ Performance Education, a division of Drum Corps International, has been presenting its Live Learning Event series with top World Class corps all summer long! 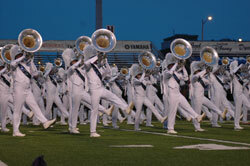 Students have jammed with champion drum lines and seen how beloved corps like the Cadets rehearse. With three more chances to experience a Live Learning Event before a contest near you this summer, you too can learn from the best of the best! Admission to each of these Live Learning Events is FREE for ticket holders to that evening's competition, giving you two and a half hours of instruction before an evening of electric performances! Read below for details on each event. Experience a 'day in the life' of a touring drum and bugle corps through an educational 'hands on' experience with the members and staff of the Glassmen. This OnQ Live Learning Event/ENTERTRAINMENT clinic will take place on July 16 in Lafayette, La. Over the course of the clinic, students and directors alike will be invited to participate with the members of the corps as they demonstrate the fundamental performance concepts for their sections and practical application to portions of the corps' 2008 summer production, "Kar-ne-vel." And if all that ENTERTRAINMENT wasn't enough, you'll have the chance to see the Glassmen once again as they perform with nine other corps at the Drums Across Cajun Field event. 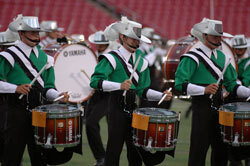 The Cavaliers have medaled every year for the past nine seasons, and they'll be demonstrating some of the techniques they use to condition their members and push their performances to the limit and beyond on July 21 in Broken Arrow, Okla. The two and a half hour Live Learning Event will emphasize individual sections, ensemble performance, and how the entire show comes together as the corps takes attendees inside their 2008 production, "Samurai." Then come back for the evening show to cheer on the Cavaliers as they compete in the "Drums of Summer" DCI Summer Tour event. If you've ever wanted to get up close and personal with the Phantom Regiment, you can't miss the July 22 Hattiesburg, Miss. Live Learning Event. Not only will you get the chance to learn how the corps approaches technique in a 50-minute sectional breakdown, you will actually sit inside the horn arc as Phantom plays selections from previous years, followed by a run-through of the corps' 2008 field show. You'll have an insider perspective as you watch the corps perform their production "Spartacus" at the DCI Southern Mississippi contest that evening. Power, innovation, tradition. 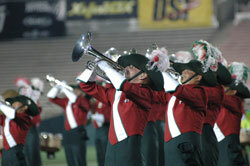 The Santa Clara Vanguard has it all, and six World Championship titles to boot! Before you sit in the stands and watch eight World Class corps perform on July 25 at Pearl Presents the Masters of the Summer Music Games, you can see the Santa Clara Vanguard as they rehearse and perform their 2008 production "3HREE: Mind - Body - Soul." You'll get to see the corps members work through parts of their performance before they take you on a thrill ride like only the Vanguard can.